The Internet is a great data gathering tool! Just this morning, we saw a post on one of our favorite blogs, Events by Evonne, where Evonne was being featured on one of her favorite blogs, Melissa's Smitten. 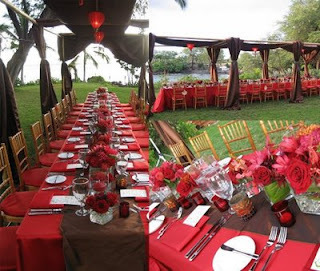 Evonne did indeed put together quite an event at the featured wedding, and used our Dellables florals and dining canopies. It was indeed a presentation that took the magic up a notch, even for those of us used to seeing fine weddings. We blogged this same wedding at home back in October as well, Elegance by the Sea.